Join Elizabeth Austen, Washington State poet Laureate, teacher, and performer for a poetry reading and workshop this September. Methow Arts brings Austen to the Merc Playhouse on Sunday, September 13, 11 am for an adult workshop entitled Poetry for All. Elizabeth Austen is a Seattle-based poet, performer and teacher. She’s the Washington State poet laureate for 2014-16. Please note, the public reading that was scheduled for Saturday, Sept 12th has been cancelled. Please consider attending the Blues for the Burn 2015 fundraiser at the Virginian Resort in Winthrop. Join Washington State Poet Laureate Elizabeth Austen for a free, hands-on poetry workshop designed to engage participants’ imaginations, life histories and sense of empathy through language. The class includes close reading of a few contemporary poems, then using one as a model for writing our own first draft. No previous writing experience needed, and all are welcome. Maximum 25 participants. At the Merc Playhouse. Email us at Methow Arts, info@methowartsalliance.org to register or call 509.997.4004. Elizabeth Austen is a Seattle-based poet, performer and teacher. She is the Washington State poet laureate for 2014-16. Austen spent her teens and twenties working in the theatre and writing poems. A six-month solo walkabout in the Andes region of South America led her to focus exclusively on poetry. 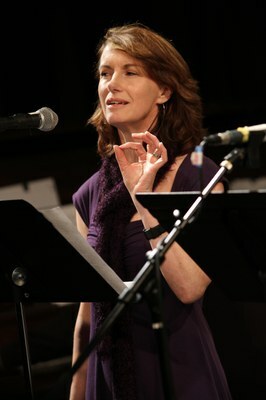 She is the author of Every Dress a Decision (Blue Begonia Press, 2011) and two chapbooks, The Girl Who Goes Alone (Floating Bridge Press, 2010) and Where Currents Meet, part of the 2010 Toadlily Press quartet, Sightline. Her poems have appeared online ( The Writer’s Almanac, Verse Daily), and in journals including Willow Springs, Bellingham Review, the Los Angeles Review, the Seattle Review, DMQ Review, and anthologies including Poets Against the War, Weathered Pages and In the Telling. For more than a dozen years, Elizabeth has produced literary programming for KUOW 94.9 public radio, one of Seattle’s NPR affiliates, introducing recordings of Pacific Northwest literary events and interviewing local and national poets. Search for “Elizabeth Austen” or “poetry” at www.kuow.org for audio links. She served as the Washington “roadshow” poet for 2007, giving readings and workshops in rural areas around the state. She is the recipient of grants from Artists Trust, 4Culture and the City of Seattle, and is an alumna of Hedgebrook, Artsmith, the Whiteley Center, the Jack Straw Writers Program, and Antioch University-Los Angeles (MFA in poetry, 2001). She makes her living as a content strategist at Seattle Children’s Hospital, where she also offers poetry and journaling workshops for the staff. DATE: Reading, Sat, Sept 12, 5pm $10-20 sliding scale. Students free. At the Merc Playhouse, Twisp, WA. Workshop, Sun, Sept 13 11am, Merc Playhouse, donations appreciated. CONTACT: Methow Arts, info@methowartsalliance.org to register or call 509.997.4004.